Taking out a wallet loaded with cash, receipts and loyalty cards and searching for coins in front of a cashier is a familiar scene at stores in Japan. But the country wants more consumers to kick that habit and engage in cashless transactions using credit cards, debit cards and electronic money. With the government seeking to double digital payments to 40 percent of all transactions by 2027 from 20 percent in 2016, the momentum for cashless payments has been rising. Why is Japan promoting a cashless society? 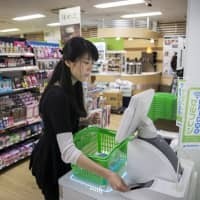 According to the report “Cashless Vision,” compiled by a panel of experts under the Ministry of Economy, Trade and Industry, cashless systems at retail stores will save manpower at a time when Japan desperately needs to improve productivity amid a labor shortage and declining population. The cost of handling cash is increasingly worrying businesses. Nomura Research Institute estimates such costs exceed ¥1 trillion annually. Is Japan falling behind the global cashless trend? Estimates by the government using 2015 data from organizations including the World Bank and BIS show Japan’s cashless rate was only 18.4 percent, while that of China was 60 percent and South Korea’s was 89.1 percent. South Korea pushed cashless transactions mainly using credit cards after its 1997 financial crisis to better control taxes and stimulate the economy. People receive tax deductions for credit card purchases. Retail stores whose sales exceed ¥2.4 million must accept the cards. In China, where trust in cash is low and costly, smartphones have become a popular payment tool in recent years. Two mobile payment platforms, Alipay and WeChat Pay, are dominant forces. Alipay is run by Ant Financial under e-commerce behemoth Alibaba, and WeChat Pay is operated by Tencent, the country’s biggest messaging app provider. The figures for Canada, England and Australia were over 50 percent as well. In contrast, Germany was lower than Japan, at 14.9 percent. Why is Japan sluggish in adopting cashless? Trust in cash, the sense of safety in carrying it, fewer stores that accept credit cards and e-money are factors pointed out in the Cashless Vision report. The report, released in April, noted cash has been reliable in Japan, where counterfeit bills are rare. The crime rate is low, so people feel safe carrying cash, and ATMs are readily available. Also, although many convenience stores and large retailers allow various payment tools, many small enterprises only accept cash. A search for Tokyo eateries that accept credit cards on the Tabelog website, a popular restaurant search service, found only 49,350 stores out of 135,764 as of last week. Smaller outlets are reluctant because of the cost to process credit card and e-money transactions, the Cashless Vision report pointed out, noting credit card fees can cut into their profits. Credit card fees can average 3.09 percent, according to January research by Nomura Research Institute. If there are more cashless-ready stores, would that make people abandon cash? “Large retail stores, such as department stores, supermarkets and electronics shops, accept cashless payment tools that come with reward points, but many consumers still pay by cash,” the Cashless Vision report said. Also, cashless payments are not new in Japan. Credit cards have been around for decades and various kinds of e-money, such as the Suica card run by East Japan Railway Co., were already available in the 2000s. Therefore it is necessary to analyze consumer behavior and psychology, it said, adding efforts to increase cashless-ready stores are needed. Is the momentum going to keep growing? It is likely to continue, since major new players are entering the cashless payment field and are serious about promoting their platforms to stores and users. Line Corp., a messaging app giant, is eagerly pushing its Line Pay payment service, which accepts payments by scanning QR codes, plastic cards or smartphones equipped with FeliCa chips. 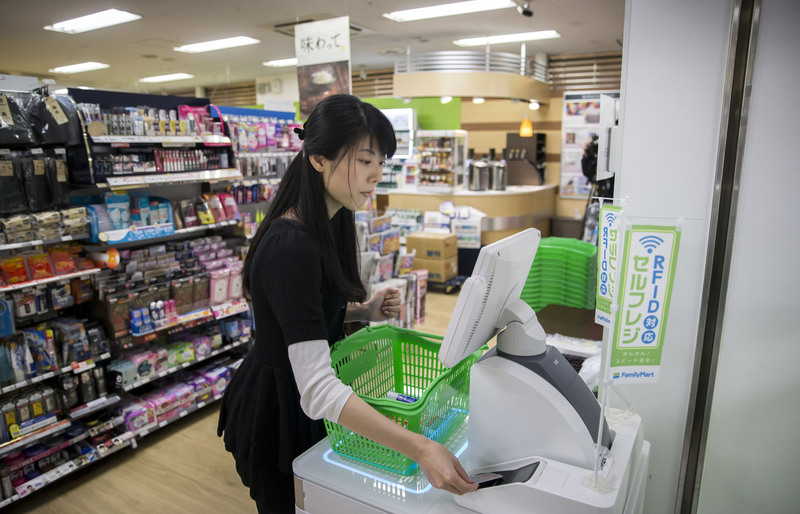 Line exempts the monthly cost of scanning devices for six months to smaller outlets if ordered within this year and takes no fee from sales until July 2021 to lower the bar for starting cashless payments. Last week it announced plans to team up with Tencent in this field. Chinese travelers to Japan can use WeChat Pay at stores that accept Line Pay starting early next year. This could be a strong motive for stores to go cashless to benefit from the growing number of Chinese tourists, while Line can widen its platform. PayPay Corp., which is a mobile payment firm jointly run by SoftBank Group Corp. and Yahoo Japan, is partnering with Ant Financial to allow Alipay users to make payments with their app at PayPay-ready stores. Alibaba is part of the SoftBank group. PayPay also announced last month that it will launch a ¥10 billion rebate campaign starting Tuesday in which customers can receive a 20 percent rebate for every purchase through the PayPay mobile payment platform. The limit of the rebate is ¥50,000 per month and the campaign will end when PayPay gives back ¥10 billion in total. “We are waging this campaign to attract new users and to help them use PayPay. By increasing users, stores that accept PayPay will also increase,” said PayPay CEO Ichiro Nakayama during a news conference last month. SoftBank is serious about becoming the leading cashless platform in Japan, considering the huge PayPay investment, Toshio Taki, who heads the fintech research laboratory at Tokyo-based Money Forward Inc., said. “SoftBank has seen how Alibaba and Alipay have grown so big in China … so I think it is seeing value in a top payment player that can acquire (a huge amount of) purchase data in a very long term,” said Taki. Are people concerned about data privacy and security? The Cashless Vision report mentions there are consumers who have this concern. Taki said many people are uncomfortable with companies collecting minute details regarding purchase data that could be used for other purposes. While such data are precious for businesses, “people would not feel safe to buy things if there is no room for anonymity,” he said, adding discussions on this matter are still too few. Will the government consider a rebate program for cashless payments when it raises the sales tax next year? Will that help spread cashless payments? Aiming to mitigate the damage to the economy and promote cashless payments, the government is reportedly planning to give 5 percent back in reward points if customers buy items at small and midsized stores with cashless payments. But Taki said it is uncertain if people will be motivated by the point incentive. Taki said the incentive will serve as motivation but he doubts it will change the situation in a drastic way. “It is important that the policy will help small and midsized stores boost sales, but that isn’t the case at present. It is instead just rewarding users,” said Taki. Tax incentives for stores may work well, for instance, by reducing taxes for stores whose cashless sales are high, he said.